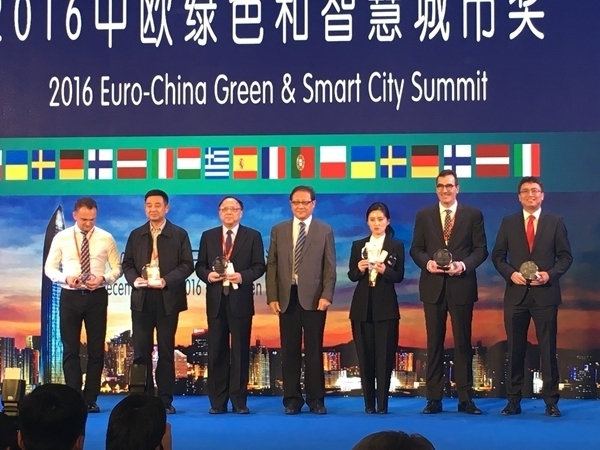 Hengqin New District of Zhuhai, Foshan and Shenzhen of Guangdong province have all won prizes for industry promotion, technological innovation and 'excellent city' in the 2016 China-Europe Green and Smart City Award appraisal on Dec 10. Hengqin New District of Zhuhai, Foshan and Shenzhen of Guangdong province have all won int'l prizes for industry promotion, technological innovation and 'excellent city' in the 2016 China-Europe Green and Smart City Award appraisal on Dec 10. The Potevio New Energy Company in Shenzhen won the star enterprise prize of the award. The award aims to encourage cities in China and Europe to pursue green development and smart infrastructure, promote cooperation between industrial parks and enterprises as well as inter-city and inter-industrial park exchanges. The prizes are awarded by the Chinese City and Small Town Reform and Development Center and the French Prospect and Innovation Foundation. They are also jointly issued by the China-Europe Green and Smart City Three-Year Action Plan. The two organizations will select two winners, a cityorindustrial park, each year to help them further improve their planning, construction, investment and operation. More than 80 cities and enterprises from China and Europe took part in this year's award appraisal. Among the prize winners, 12 are from China and 22 are from Europe. The three-year action plan said the two organizations will encourage more cities and industrial parks from China and Europe to form sister-city or sister-park ties in investment, financing and technology exchanges. It is planned that many financial agencies from China and Europe will take part in the inter-city and inter-park cooperation in the future, and there will be a China-Europe Green and Smart City Development Fund, as well as a regular training program for the executives and administrators of cities and industrial parks. According to the plan, there will be an Annual Report on China-Europe Green Cities as well as an Annual Report on China-Europe Smart Cities. Feng Kui, General Secretary of the Academic Committee of the Chinese City and Small Town Reform and Development Center, said there will be a contact mechanism between the Chinese and European cities, and there will be a regular seminar and round-table mayor's dialogue on China-Europe green and smart cities. The study by the two organizations on the plan is the only one of its kind in China that focusses on China-Europe green and smart city development.